Pens and pencils out – it’s time to call back those art skills and start drawing tags. Computer vision is all the rage again. One assumption seems to be that you’ll know the technology has evolved when markers – graphical identifiers that allow the camera to more easily spot control points in the image – go away. Not so fast. The beauty of markers in computer vision (like the popular ARToolkit) is twofold. First, those markers are there for a reason. Adding specific graphical information to an image can improve recognition, improve recognition in specific circumstances (like changing lighting), and improve performance (by allowing the computer vision routine to do less work). That means that markers are likely to have a place for a long time to come. Even on powerful desktop computers, they’re likely to find specific applications, and on much less powerful mobile platforms, I think you’ll see still more. 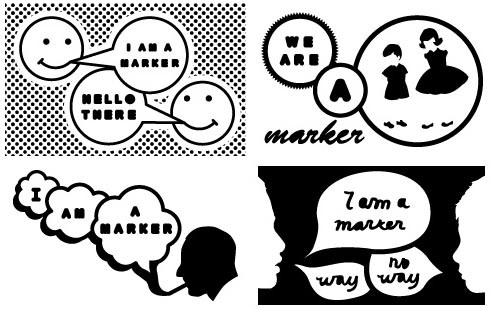 But the second reason is that markers provide tangible objects connected to the interface. That’s the sense of physical objects and tactile feedback that’s so sorely lacking in digital interfaces in general. It’s forward progress, not backward progress. Of course, this is more compelling if you can make the visual appearance of the markers part of the design. That’s where the d-touch library gets so interesting. On Create Digital Music today, I cover how this system is used to create a tangible music sequencer and drum machine you can go download for free. 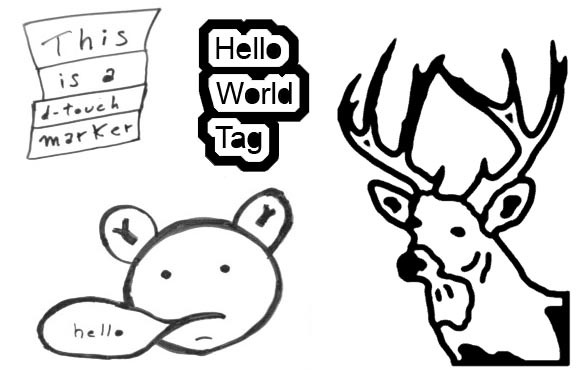 But the other story here is that you can finally make tags that look like whatever you want. Using d-touch’s design rules, you can create fairly elaborate black and white designs of your choosing. The camera is looking for regions of black and white, so the trick is not to “nest” areas of white or black inside of other areas of white or black. Translation: most of your doodles will do just fine. You can get quite into design issues, though, like imagining how things will look when blurred. The developers have also created analyzer software for Windows, Mac, and Linux that will look for trouble in your designs. It’ll help analyze which regions are which in the design you’ve created. What can you do once you’ve got it all running – and don’t necessarily just want to fiddle with the drum machine? Well, if you’re building a project in a C++-based toolset like OpenFrameworks, you can add d-touch directly to a project. The creators have libdtouch, an open source library for working with tracking. Alternatively, d-touch has a server that can transmit data to any application. D-touch isn’t the only toolset moving in this direction. I’ve seen interesting applications that embed either more interesting pictures inside the tracking rectangle set up for ARToolkit, or that actually incorporate real data by using ZRCodes and other encoded graphics the camera can read. As usual, I’m sure we have readers who know quite a lot more than I do, so I’d be curious to hear thoughts on tracking accuracy and different applications and alternatives. But I could see some great excuses to get drawing again. And frankly, aren’t these objects more interesting than just waving your arms around in front of a webcam?